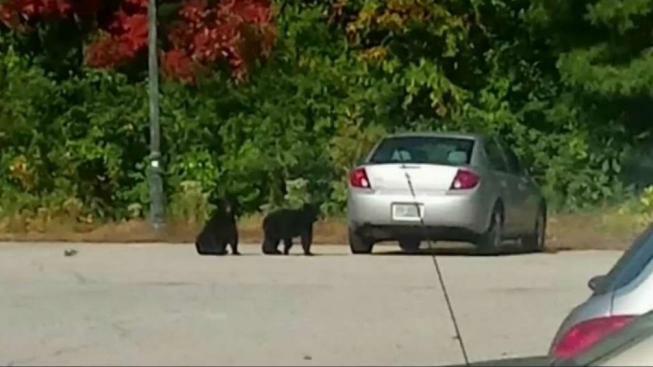 Some Manchester, New Hampshire residents have a lot of questions after the Fish and Game Department shot and killed two bear cubs very close to some apartment buildings. John Pelletier and his wife Sandy were sitting outside their Sundance Village Apartment on Tuesday morning when they realized they had some company. “Standing right where we are were two black bear cubs,” Pelletier said. The bears quickly scurried off into the woods. Minutes later, the couple heard gunshots. “I’m an animal lover and it’s very upsetting to me,” Sandy Pelletier said. In trying to figure out what had happened, John Pelletier approached a man who he said was dragging one of the dead bears out of the woods. “He picked up the bear by the neck and the rump and threw it into the back of the pickup truck,” he recalled. The Pelletiers said the man refused to identify himself and sped off without any explanation. “It was just all so suspicious,” Sandy Pelletier said. But Glenn Normandeau with the New Hampshire Fish and Game Department said the man was an experienced biologist checking on the cubs. He said the expert made a split-second decision to shoot the bears as they made a beeline for a busy road. “Trying to prevent a traffic accident caused by these bears going onto the highway,” Normandeau explained on Thursday. The Pelletiers are so frustrated by the bears’ fate that they plan to bring their concerns to the governor’s office. “This was a man who showed up here with the intention of nothing but killing two bear cubs,” John Pelletier said. But wildlife officials said it’s just the opposite. “Nobody likes doing this,” Normandeau said. Lots of neighbors are asking, why not tranquilize the bears? Normandeau said the cubs needed to be stopped in their tracks immediately before they could enter the road, and a tranquilizer can take several minutes to work. As for the biologist at the center of this, Normandeau said he’s been advised to identify himself next time around. Fish and Game officers respond to upwards of a thousand bear calls every year. On average, only three to five bears need to be put down.